Pilot functions inspired this Casio G-Shock Premium Sky Cockpit model, this watch features a digital compass with 20 second history, allowing you to maintain a course or bearing easily. This model also benefits from a neon illuminator back light, that lights the hands and markers out in low light at the touch of a button. The movement is quartz, and also features a thermometer, world time with 48 world cities, 24 hour chronograph with split function, five alarms, date with full auto calendar, and countdown timer. The case is water resistant to 20 atm, and is a stainless steel core, with resin protective pieces, giving the watch incredible shock resistance. 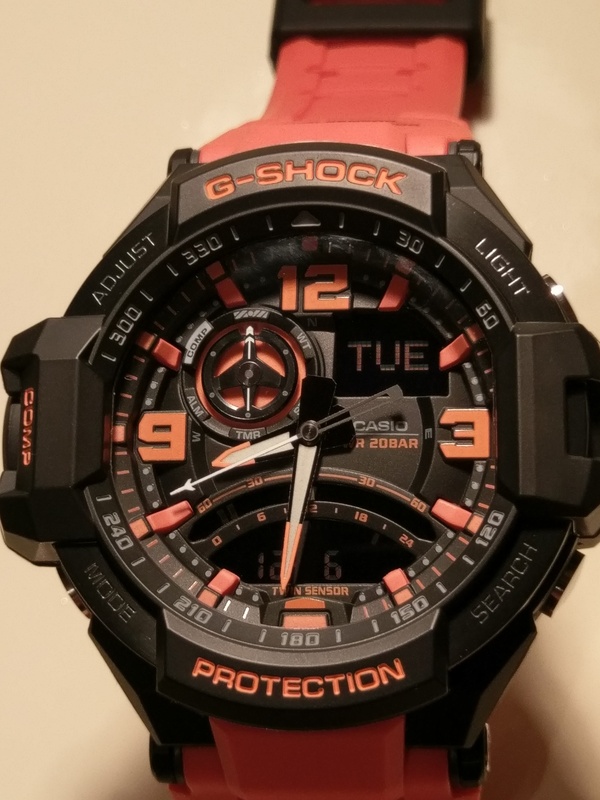 The watch fastens on a bright orange rubber strap, and matches the orange highlights on the black dial. bought this for my sons brithday - it was a bit last minute but the guys at watchshop got it delivered quicker than their promise. Nicely packaged and looked superb. My son was over the moon. Thanks Watchshop! Great looking Watch with everything i need and a very comfortable fit. Watch: Solid, very comfortable to wear, orange straps stand out but with lovely taste, compass working great, thermometer - make sure you take it off for a few minutes before you use it, otherwise its you body temp. Neon Illumination works Good but sadly not perfect - in very low light condition you need to focus to read time properly - but once you eyes get used to its clear. Its my second G - Shock ordered from the same company : I have exposed watch to extreme conditions -30℃ up to +45℃, underwater down to 30m - Never Failed. After 6 years sadly battery died and I thought it is time for a change. Thank you very much for great service - definitely I will you again sometime in the future. My best G-Shock ever!!! Not to mention my first online watch purchase... Needless to say that I was one of a few that were sceptical about buying stuff online especially watches not to mention for the first time. Im always a big fan of G-Shock watches but this particular model just raised the bar exponentially. The dark orange color in contrast with black, plus the variety of background colors when you illuminate it is just exquisite!!! I havent even explore it fully and read the manual and Im already excited...Felt in love the first time I saw it in your website...I thought if its too good to be true then it must be...but this is an exception...just simply look at the photograph!!! It says it all...Enjoy!!! Terrific acquisition to my watch stable! 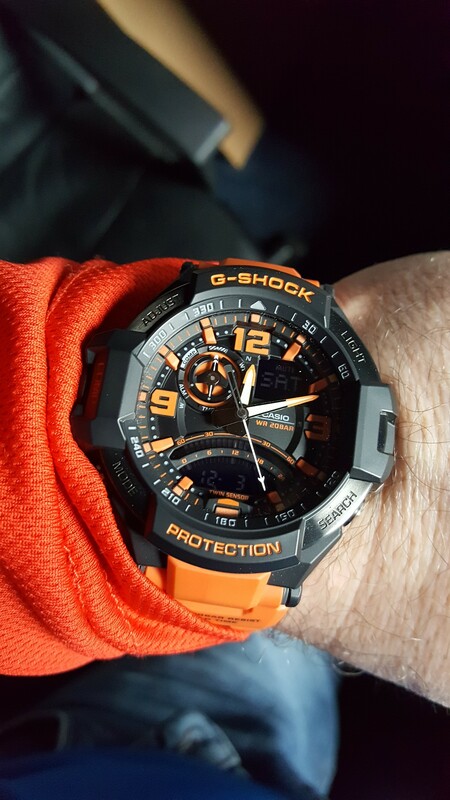 I love my watches and this G Shock will sit proudly with the rest of my smart sports watches. Excellent customer service from web page to collection point at Goldsmiths store. Ive never used The Waych Shop before, but I will definitely be returning! After wanting this watch for about 6 months i finally got one and i absolutely love it. Watch arrived very quickly and looks great, all gift wrapped very nicely so was great as an extra touch for giving as a present for a 50th birthday. The watch looks great!! 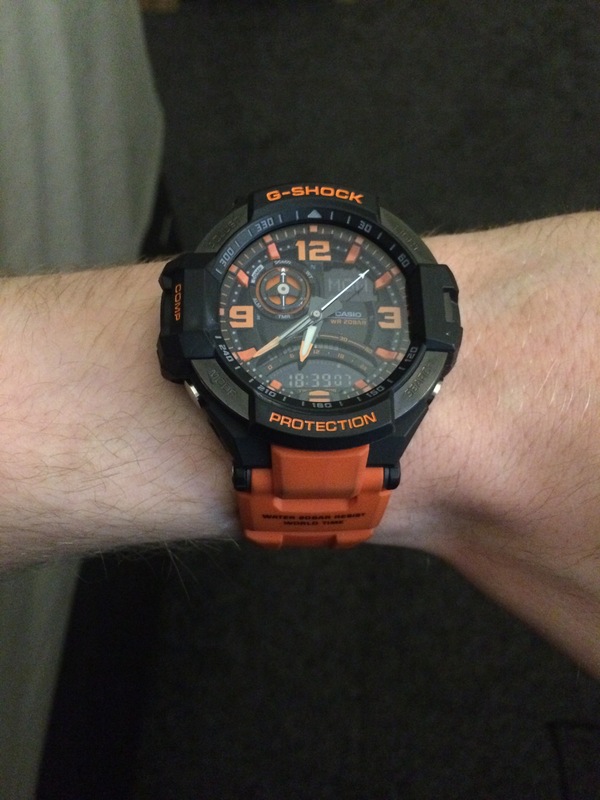 My son wanted a G-shock for his birthday and the colour was chosen because its quite hard to miss & he is generally quite careless with personal items but seems to love this one ! Well made watch, ideal for using whilst out mountain biking. The watch was exactly what I ordered and more. The service from Watchshop was more than I expected. 10/10. 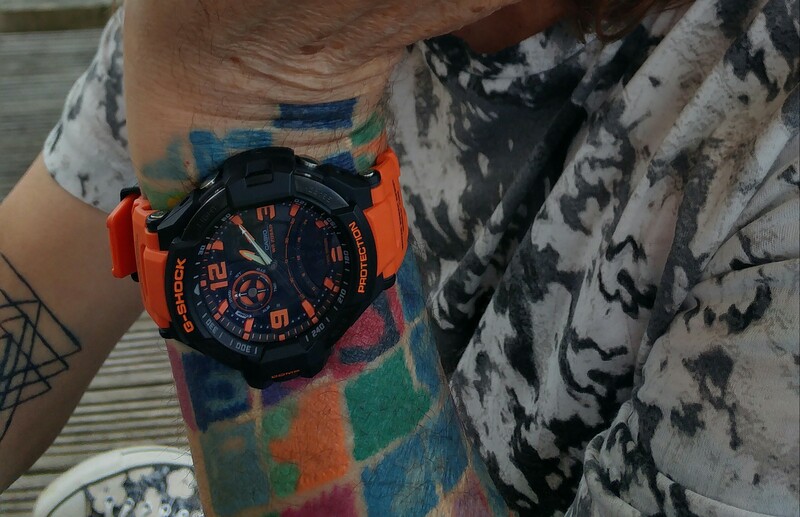 I bought this orange G Shock for my husband to go with his full sleeve tattoo. We are both thrilled with the watch and as you will see from the picture it looks amazing! 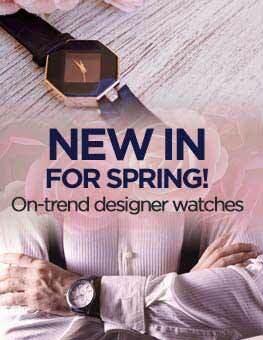 When opening the box this watch first shocks with its bright bold colours and impressive large face. But when you put it on it seems light, yet tough and up for a challenge. You know your wearing this watch but it doesnt feel bulky or too large and sits on your wrist nicely. Its a fantastic watch with lots of features you will probably never use! In all honesty its a cool watch that looks great, works brilliantly and wears well. I would give this watch 5 stars!! Really pleased with the quality of this watch. It looks great with the orange not being too in your face. G-Shock ooze quality from the moment you open the box you find a hexagonal tin that is keeping your watch safe and sound. The watch itself doesnt disappoint. Its solid without being heavy. After a bit of set up its easy to use but the sequences to change time etc will take a bit of remembering. Overall I cant fault this watch. Thanks Casio. Excellent watch, really stands out and has so many features. Had my eye on buying it for some time, finally got and it is exactly what I expected if not better. brilliant watch, very easy to use [kept me occupied for 4 hours in A+E]. Not like G-Shocks Ive had before where I needed the kids help to set the timer!! Only just given to husband birthday present, but looks lovely. Very attractive watch. Appears to have lots of good features, but needs to read manual before can comment too much further. So far so good! 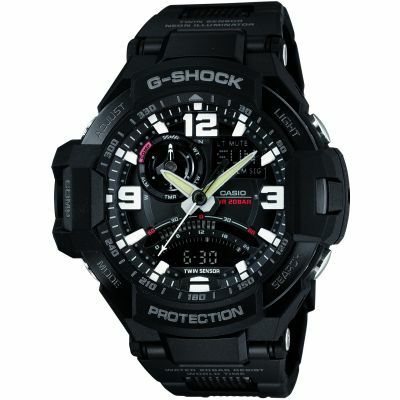 I had been looking for a while at a new watch and specifically G-Shock watches. I ended up deciding on this model and glad I did, the look is really nice. The orange bands have a good look to them so it stands out and also feel strong and dont feel like theyll snap off, the watch face is nice and big and feels really durable which is exactly what I need. The watch has a lot of really good functions and is really easy to use once you have a wee play about it with it! 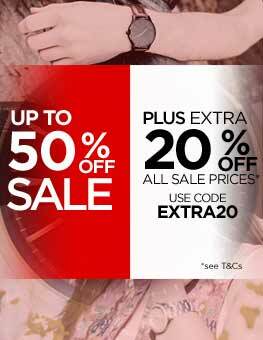 Definitely worth considering or buying if looking for a new watch! The watch is great and works well, the only downside is the digital readout as it so small and you cant really see it, Also you cant read the digital bit at night . Other than that its an ace watch . Its much lighter then other watches of similar size. At first it can be hard to understand how to use, the instruction booklet is quite small, but you get the hang of it pritty quickly. Eveything works fine, however I am unsure about the accuracy of the thermometer, I like in England, and its currently January and its telling me the temperature is arround 30 degress C. I am going to try and calibrate this as per the manual which will hopefully correct it. In person the orrange colour of the strap is alot nicer the the image shown, is a darker deeper orange. Love the neon light, its much better then the standard illumination strips. I dont participate in many outdoor activities, but its just as good as a desk job watch. Fantast watch. This is my 4th gshock and IMHO you cant get a better functional and stylish brand than gshock. I have used the compass function and it is very accurate. 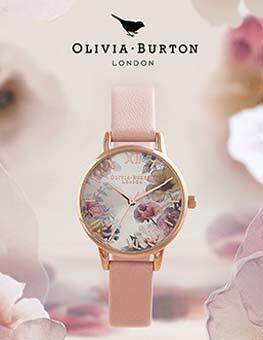 I like the colour and design of this particular watch as it can be worn for any particular occasion. The led illumination is excellent and all functions are only a press of a button away. Very impressed with this latest gshock. Really pleased with the product and very impressed with the service from watch shop, I was kept informed right the way through the process even collection from store was hassle and the staff were very friendly. I will certainly use watch shop again. No dissapointed exactly as I expected from g-shock. Ive had a few g-shocks which have been fail safe for years and they just keep getting better . This watch has everything I need including a compass in case I get lost on the way to work! Great style and looks good either dressed casual or smart. I would highly recommend a g-shock if you want peice of mind. No worries if it gets knocked about. Great product. Great watch. Great quality. My husband was made up with it. Thank you. Nice watch, brought myself as a birthday present, looks good and is easy to use! Watchshop have done it again, its the third time I have brought from them and probably will buy more in the future. Delighted with product , although classed as oversized it looks great on and not uncomfy to wear. Had to set the time myself to the correct time zone and time and after reading instructions this was done with ease although when it says press A for 5sec you do have to do this even after the beep ! The compass is a great feature and very cool as is the illuminated screen. The watch is both sturdy and hard wearing as with all G-shock watches, dont be put off by the coloured stamps they add character and make watch stand out, number of people asked where I got watch from, for the price which I consider very reasonable i think its great value for money and while maybe not a designer watch as such I think its timeless and suits all age groups and although casual looking looks great even when dressed smart, this is my 3rd g-shock and will definitely be adding to that number with this watch but in a different colour !! Big. Bold. Strong. This watch will make you all of those things and more. I cant rate it highly enough, looks fantastic, can do everything under the sun, and I know will save my life one day whilst looking incredible for wearing it too! The compass, thermometer, ruggid case and display are the watches greatest features! I could play with it like a penguin chasing its tail all day! The only negative is that during my super secret 007 night owl missions, the Orange stands out a bit, but then whats life without a challenge huh? in all seriousness, the Orange looks great, not tacky or luminous if thats what youre thinking! I give it a Three Thumbs Up! Had my eye on this watch for ages and was unsure whether to go for this or the 3000m-4aer. Very pleased i choose this one though. Looks far better than the picture gives it justice. I dress casualy 99% of time so suits my look, i wouldnt recommend to wear with suits/smart wear its a bit to orange! But all in all i love it and works perfectly. 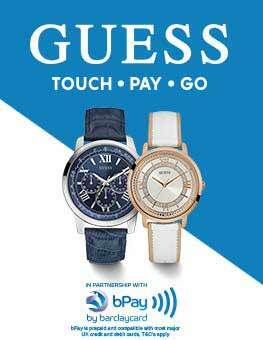 Watchshop as promised delivered on time and also decided to purchase using 0% finance which very quickly and effectively applied and was given. Dont hesitate buy it ! Great watch. Very easy to use. The blue LED lights are a lovely touch. Very happy with this purchase. Its a gift for my partner. She love it so much and the bracelet was so soft and the watch itself is so amazing. Ahe said its a nice watch and really nice on her wrist. Its so light and so attractive. Simple but captivating with others. Very stylish and clever watch, the manual was a bit daunting,however easy to follow. I loved the way the watch updates to the various home city settings. Clear and easy to read in very low light levels, which is a first for me. Temperature and compass functions are excellent. I only hope the watch strap is robust and easy to source in a year or too. A chunky, cool watch which is G-Shock at its best. Love the orange strap that makes it stand out from the crowd. Loaded with all sorts of function which I will probably never use but good to know they are there. Outstanding service from start to finish from Watchshop ,price matched the same day,ordered then delivered the next day for free. The watch itself is stunning ,better than the pictures and a real eye-catcher, well made and real quality, would recommend to anyone ,just like Watchshop who also gave me loyalty points which i have used to buy the wife a watch.Everyones happy !. Priced matched - next day delivery. What more can I say a very good experience. A fabulous product that I am really pleased with. The watch is very simple to use straight from the box. The features are straightforward and logical to use. A very large bezel that wont suit people with small wrists. 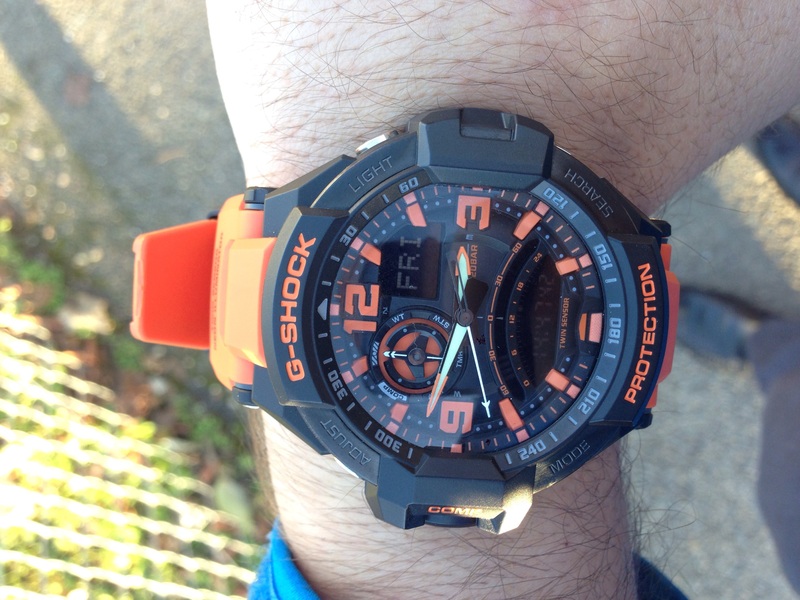 Totally looks like a G-shock and the colour in orange stands out. Not quite as bright as shown in the images. Definitely an outdoors enthusiasts watch that looks like it will protect you from falling rocks its that rugged. 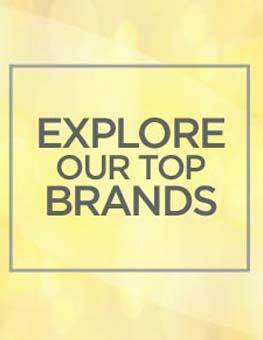 Ive had other similar products from competitors and can honestly say I dont know why I didnt buy a g shock in the first place! I got this watch for my self , having looked at it on the website I was a little unsure about it .but when it arrived I was over the moon with my purchase great looking watch id recommend it 2 any 1. I had been looking to purchase the G-Shock GA1000 4AER for some time and finally bit the bullet when I saw it on watchshop. I hadnt spent this much on a watch before so I really wanted to make sure this was the model for me. I was tempted to buy it from the US but with customs fees on-top the price worked out the same as watchshop plus they offered free next day delivery. Having received this watch the next morning after ordering I must say it looks stunning, and is every bit as eye-catching as I wanted it to be. The Orange and black combination is fantastic and the large face size and digital features are second to none. The compass feature is brilliant and a great show off trick, with the second hand automatically spinning to point to north at the push of a button. The lights on this are also brilliant. The hands, dots and tip of the second hand glow very bright so there is no problem reading this in low light. 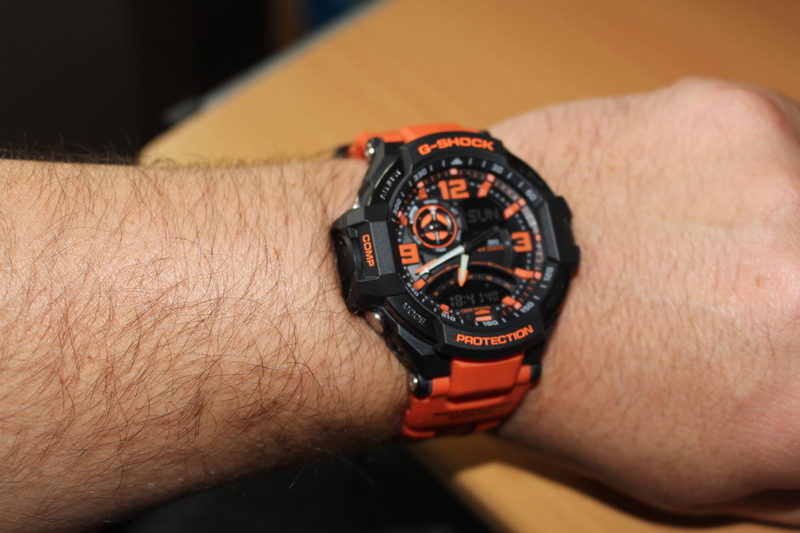 The whole quality of this watch is excellent and I am now in love with the G-Shock range. A great watch from a very under-rated brand. If youve been thinking about getting a G-Shock for around £200 this is the perfect watch. Go for it, you wont be disappointed. This is one of two new Casio watches I bought to replace a faultless Casio Gshock Ive had for 5 years. 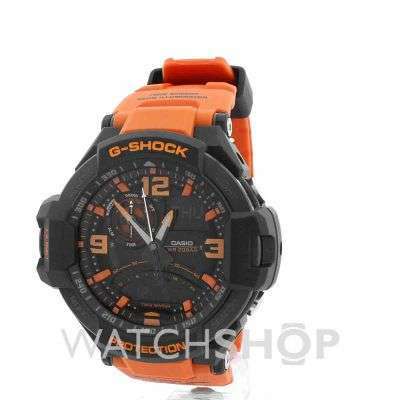 I was attracted to this model by its functionality, and yes, the orange strap and dial detail. I am not disappointed. Functionally its fantastic, all of the various features being easily accessed. The dial is 3D in a very attractive way, the appearance at night with the luminous hands and dial illumination being stunning. I dare say using any function except the analogue time display in the dark is not really practicable, but these work perfectly well in normal ambient light. I wanted the timers for sports competition session timing, and this works really well. This watch is really stylish in appearance. Past experience tells me that the strap will wear out after a few years - I hope a replacement strap will still be available then. Altogether a great buy. Watch was bought as a Christmas present. The boyfriend loved it. It looks so much better in real life than on the Internet. Very pleased with purchased. This is an excellent looking watch. Chunky and comfortable to wear. Really noticable in this colour. Easy to use, only the kitchen sink missing from its uses. You wont be disappionted with this watch.